Sometimes I feel as though I know you. I mean, I ‘see’ you here – in the blogosphere – most every day. I read your thoughts, I respond to your thoughts, and sometimes you respond to my thoughts in response to your thoughts. But your name, what is your name? I’ve seen some people call you by name, while others address you by your blog name. If I know your name, but you didn’t tell me your name, may I call you by your name? 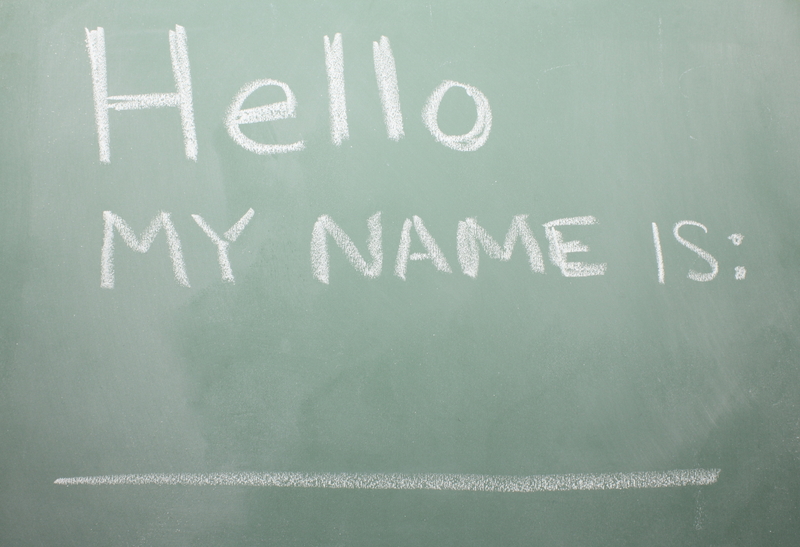 At what point is it okay to refer to you by name? Or, is it ever okay to refer to a fellow blogger by anything other than how he/she signs the posts? My name is Lenore. Not coincidentally, the name of my blog is Lenore Diane. I know other bloggers that have their name included in the name of their blog: Georgette Sullins, EMJAY and Them, Jacquelin Cangro, Julie True Kingsley, etc. When I leave responses for the above bloggers, I typically refer to them by name. I feel pretty safe using their name, since it is the name of their blog. But the others … the bloggers out there, spinning tales under the guise of an elusive blog name like*: “She who writes”, “I take my coffee black”, “Sometimes I am wrong”, or “One day, when I was little, yesterday”. Who are these bloggers? One commenter addressed his comment to “David”**. Does that mean the blogger’s name is ‘David’? May I address him as ‘David’, too? Or, do I have to wait to be introduced. How does one get introduced within the blogosphere? Does the commenter initiate the introduction, or is it up to the host/author of the post? Though, as I have already noted, my name is right there on my blog for all in the world to see. Still, just to be clear, I am going to officially introduce myself. Hello, my name is Lenore. It’s a pleasure to meet you. I hope you will visit me again. *These blog names are fictional. Any blog matching a mentioned name is purely coincidental. ** Though the name “David” is real, the name was used for hypothetical purposes only. No actual Davids were used or harmed during the writing of this post. My name is Val (short for Valerie. Don’t call me Valerie, unless you are a long-lost relative that I didn’t know about, or you’re another Valerie (which you aren’t, you’re a Lenore, though I don’t know if the ‘Diane’ is a last name, a second name or a made-up name. No, it’s not made up, I’ve known a lot of Dianes and none of them were made up. Well, not in the fantasy sense, anyway) or you happened by my Redbubble portfolio where I had to call myself Valerie because I’d already been Val there and… oh heck, nevermind! I put my first name on my profile to go along with my gravatar (the userpic) so that when I comment people will know what to call me. Many people don’t know how to do that or even that it can be done. But years ago I had a blog on which I used a pen name (or pseudonym, or whatever) and nobody knew who I was. Not really. And that was great. What to call people? Well, let’s see. How about ‘OY! YOU!’? Or maybe not. It seems a little rude. Oh, Diane is not made up – just like the other Dianes you know. It was my middle name, until I married. I am NOT going to call you Debbie. I’ve seen others call you “Hipster”, but I wasn’t sure I was hip enough to call you “Hipster”, so I stuck with “HC”. If it is OK with you, I’m upgrading “HC” to “Hipster”. Okay, Hipster? Though, your taste in music reminds me of my sisters Jane and Carol. Maybe I’ll call you Jane. You don’t have any negative stories involving a “Jane” do you? Good to meet you, Lenore! Like you, I am quite happy for everyone to know my name. I am quite happy to “own” whatever I say in public fora. I even type my name at the end of every blog post, possibly because I think of them as letters, or some form of communication at any rate. It took me a long time as a child to “grow into” my name, and I am certainly not going to trade it now for somethingwithoutspaces54, or whatever! While some people have concerns about exposure on the Internet, and to a degree I share those concerns, I like the fact that my name is an integral part of my individuality. I am not going to compromise that by adopting any other name than the one given to me. Welcome to the neighborhood, Allison w/two ls. (smile) Nice to meet you.Thank you for visiting. I’m proud of “Lenore” as well. Well, Miss Lenore. My name, as you know, is Katy. My blog is k8edid. Most folks figure it out, but I am called k8 a lot…in day to day interactions with folks, I’ve always corrected them as Kate doesn’t sound like my name. Here in blogland, I don’t mind at all. Initially, I called you k8 because of the blog name, and I liked the k and the 8 together. But, as I’ve seen ‘Katy’ used more (and used by you), I’ve made an effort to call you “Katy”. Hey do you remember the song “Katy… beautiful Katy, you’re the only g g g girl that I adore. When the m m m moon shines, over the cowshed, I’ll be waiting by the kitty k k kitchen door.” Wow. I have no idea where I learned that song… Sorry. My grandfather, whom I adored, sang it to me all the time. I miss him so. He also called me Ka-diddle-hopper and I toyed with using that for a blog name. He taught me to fish, and swear (although I generally try to refrain) and that you are never too old to play. Oh Katy…. I love Ka-diddle-hopper! That would make for an awesome blog name. I can hear my Dad’s voice say it clearly, though it’s been nearly 20yrs since he died. We still refer to Lindsey as Lindsey Loopner. (Yes, we are still close with the family, after all these years.) Many of my friends thought Lindsey’s last name was Loopner. It was not. And I like the k and 8 together, too. I’ve made a point to keep my name off the blog, but been more open with it in email. As one of the hidden ones, I’d say you’ve got to stay with whatever the individual is using on their site. You will always be Oma to me. Though sometimes I throw out the email name, just to confuse Rob. “Wait – I thought his name was Oma.” Shhhh….. Interesting dialog here. And I wonder what music Hipster/HC likes that reminds my sister of music I like. I’d be an anonymous blogger I think. I like and appreciate the anonymity – until I read pure genius – repeatedly – then I’d want to know who you are…. Have I ever signed my name?? Oh yeah, I’m not a blogger, just a commentator. Whew. If the CIA ever knew….! And let’s not even mention the FBI. Ha! You should read the Hipster’s blog, Carol. You’d like it. She’s a huge Dan Fogelberg fan. I’ll email you a link to her blog, in case you don’t come back and read this note. I don’t even know what my name is anymore, Lenore. I was hoping you could help me?My brain is oatmeal these days. I don’t mind if people call me Maineiac, but I prefer Darla, especially once they get to know me. I wish! I’m pretty clueless. Oh that definitely works!!!! I miss the little guy! LOL Billy Jo Bob Beth Ann. Your hubby is a hoot! I’m me — when I started my online life, I didn’t even know I was supposed to hide who I am, so I’m me. People sometimes ask me if I worry about “being out there”, but it’s made me very aware of what I post. And like we’ve discussed before, I try not to post anything or comment to anyone anything that I wouldn’t say in person. Just kiddin’, Steve. P.S. I think it is your turn in WWF. I think you know I’m Patti. I’m glad you posted this, because I’ve had the same questions! Patti! That’s your name! (giggle) Yes. Like me, your blog name is your name. Gee, we sure were clever with our blog names, eh? You must know how much I heart this, Lenore! It was, after all, our names that initially brought us together. I did keep my name hidden for quite a while when I started blogging. In fact, it’s only been in the past two months or so that I put my entire name in a more prominent place on my blog. Part of that was about paranoia (hey – just because I’m paranoid doesn’t mean they’re NOT out to get me!) I was worried, for example, because of stories you read about teachers getting fired for a blog post (though I had no intention of ever writing anything that could get me fired! ), or identity theft…stuff like that. I’m always hesitant to reveal too many details because of these practical reasons. I’m also a fairly reserved, private person – at least in more recent years. I don’t know if I’ve always been but never noticed/thought about it, or if I have become more reserved as I age. It may seem strange for a private person to display herself publicly via her writing, but I can’t not write, and I wanted to challenge myself by letting people actually see my writing. And I felt less shy about exposing myself to strangers, oddly enough, than I was about letting people I actually know read my work. Eventually, I worked up the courage to let people know that I’m Leonore (of the possible nicknames that could stem from that, I prefer Leo, and use it often), and then I took the plunge and revealed that I’m also Rodrigues. So wonderful to meet you, Lenore, both here and in person! I think I’ve said in previous responses that I was leery about using my real name in the blogosphere, but over time I was more comfortable with it. I do my best to only write what – as Steve said – I would say out loud and in public. And, if they are going to steal my identity, I think they would do it in other ways. I’m angel. You can call me that. Or you can call me auntie. Which is what my family(including my husband) and close friends call me. The name Maxi Malone is on my mail box by the street; phone calls are for Maxi; most people call me Maxi. Those who have read “Meet Maxi” know this is the name I use to write my novels. There were years when I had a clothing boutique named “Peaches” and a few people call me by that name. I used my photo at one time in my avatar, but changed it to the logo on my business card. The Internet is world-wide, and can be dangerous. Some don’t want to reveal anything personal, even their name. I agree with you, Maxi, and I completely understand why some chose not to share their name. Honestly, I got this idea for the post, because I do find blogs where the writer is referred to by name within the comments. I often wonder if the writer is OK with that. I suspect it is family members or close friends leaving their support. Still, I wonder if the writer would prefer they respect the anonymity. Sweet post and I love the comments! I really can’t stand my first name. Really. I tried to change it over the years but it never stuck. My sister got the better name. You can call me SnoringDog, SDS, or JC. I wanted to change my name in elementary school. I tried to get people to call me “Diane”. It never happened. I’m glad you liked the post and the comments. It was a fun post to write. Thanks for visiting, SDS! The reason I picked the blog name I did was simply because I was working on a project of that name (minus ‘guy’) at that time, and I thought people might more easily recognize me on their site(s) that way. Later (when I switched formats), I decided to keep the name because I didn’t want to confuse people. Please feel free to call me Robert, Bob, by my screen name, and/or any slang-ish thing related to any of those. Believe me, Ms. D… I’ve been called much worse than any combination thereof! I forgot to add that you’re included in that group, my friend! Hi Leonore, Some other Mary must have got there before me so I’m marymtf. I think that unless you’re told the blogger’s actual, name or you ask what it is, you would probably need to address that blogger by his or her blog name. For me, the larger issue might be the etiquette of the return visit. Do you visit the blogger who ‘liked’ you or ‘commented’ on your blog and like it or comment in return? WordPress is always encouraging it. Good feedback, Mary. Thank you. Nice to meet you. Now this is the post that has begged to be written. Whew…thank you for straightening this awkwardness out. You know, at one point I saw you just write Lenore as your name and I thought, “Goodness, she doesn’t like LD.” Now, I can ask you, are you okay w/ LD? I only ask because I waffle between Lenore and LD. I am completely fine with LD, Georgette! I write Lenore out of habit, but LD works for me, too! Hi Lenore! Every time I see your name, the first thing that pops into my head after you, is Lenore, NC. My husband’s family is from Mountain City, TN (right near NC and VA), and friends of his have worked in Lenore in the past. But I digress. Thoughtful post today! So that you don’t have to call me M2M any longer, I’m officially introducing myself to you. I was named Susan. But over the years I have answered to Susie, Suse-ma-tooze, Suse (pronounced sooze), Sue, and just from my Dad: Suse-a-lee. Please fell free to call me Sue, as my friends these days call me that. My apologies, Linda. I don’t know if you signed a comment with your name, or if I just took the initiative when I saw your email address. I’m not sure when or why I started calling you by name. I promise to always call you something nice. 🙂 It’s good to ‘meet’ you. My name is Darcel. I don’t have my name on my blog just because I don’t want many people especially my employers knowing that I have a blog. Hello Darcel. Nice to meet you. 🙂 Your reasons for remaining private make sense, and I am sure you are not alone.